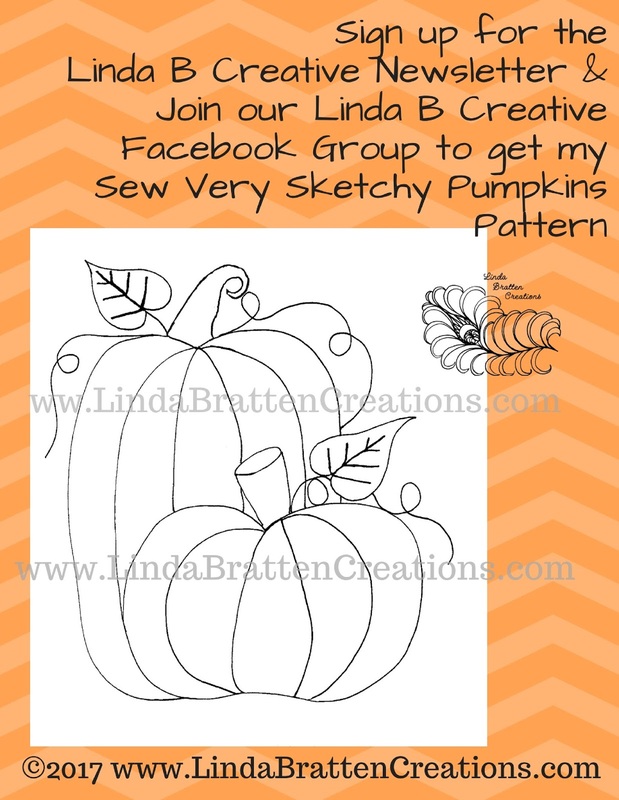 Today I am going to share with you one of my Sew Very Sketchy Pumpkins Patterns. I use this pattern to teach a thread sketching class. So let's get started! Slide on work table and knee lift (if you use one). Fabric: One piece fabric 10"x 10” of a fabric that reads like a solid, I will be using an unbleached muslin. 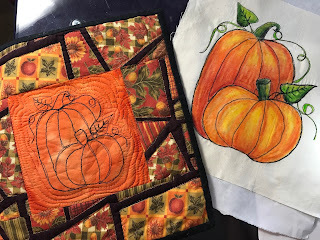 Stabilizer: One piece of a medium weight tear away or cut away stabilizer 11"x11"
Optional: Water soluble stabilizer or water soluble adhesive stabilizer 10"x10"
Sew Very Sketchy Pumpkins Pattern, This will be available for free until Sunday, October 1, 2017. This pattern is for personal use, if you wish to teach it in a class please contact me. 1. Download and print the pattern. 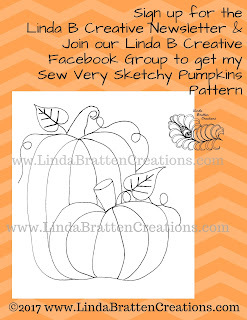 The download for the pattern is here, Sew Very Sketchy Pumpkins by Linda Bratten Creations. 2. To practice the muscle memory to thread sketch this project, put the pattern in a plastic page protector. Using a dry erase marker, trace the shapes of the pattern. 3. Next transfer the pattern to your 10" x 10" piece of "solid" colored fabric. I used a muslin for my sample. There are many ways you can trace the pattern. One way is to use a light box and trace it directly on the fabric with a removable marking tool. Another way is to use a piece of water soluble stabilizer and a permanent marker. Trace the design and then pin it to the fabric. The last way is to use a water soluble stabilizer with an adhesive backing. They often come in 8 1/2" x 11" sheets. You can use an inkjet printer set on "fast or quick" and print the pattern with your computer directly on the stabilizer. Trim the stabilizer close to the pattern and stick it to the fabric. This method will allow you to resize the pattern. I will be using the 2nd method of the water soluble stabilizer and the permanent marker technique for demonstrating. 4. Take your water soluble stabilizer with your design and put it on top of the fabric you want to thread sketch on. Place your tear-away stabilizer or cut-away stabilizer under the fabric (on the wrong side. You may want to use temporary spray adhesive to hold the layers in place or other methods to hold the layers together. Then place all three layers in your embroidery hoop, making sure that the layers will lay flat on your sewing machine bed. This is hooped opposite of when you hand sew with an embroidery hoop. I used pins to hold the stabilizer in place, spray adhesive can dissolve water soluble stabilizer. 5. Set your machine up to do free-motion stitching. Be sure your feed dogs are down. I also use a Supreme Slider to make a smooth surface for my project to glide on. 6. Every time you begin you will want to pull your bobbin thread to the top. You do this by holding the upper thread in your left hand and turn the hand wheel toward you with your right hand. The needle should go in and out of the face plate once. Gently pull on the upper thread and the bobbin thread will come with it. Repeat if it didn’t. This will prevent you from having a thread nest on the bottom of the project. Once the threads are on top, hold both with your left hand off to the left side—pull enough threads so your fingers are not close to the needle. Take 3 small stitches to secure the thread. Clip threads in left hand close to the fabric. You will also take 3 small stitches when you are done using your thread to tie it off. Feel free to use your preferred method to tie on and tie off your stitches as you free-motion. 7.You are now read to stitch on the lines. Consider how you desire to connect the lines, moving from one item to another. You may want to use the needle down feature as you go to hold your place. If you are using a spring form hoop be cautious of the handles they can bump the inside of the harp of your machine and give you a bump in your path. Remember this is to look like you "sketched" the pumpkins with a pen, so feel free to trace over lines as you travel around the project. Don't worry if you do not trace the pattern exactly as it is drawn. The pattern will be removed so you only need to be close. You may need to re-position your hoop as you move around the project. Please note that when stitching the vines, I echoed back along the path to create the vines. Also, I didn't trace the veins in the leaves. I stitch them often, and so I just created my own veins. Feel free to trace them if you need the pattern. 8. When you are finished thread sketching, secure your stitches. Then remove the project from the hoop. Tear away the excess water soluble stabilizer. Then use a wash cloth with warm water to remove remaining stabilizer. 9. Turn the project over and trim or tear (depending on your stabilizer) the back stabilizer. 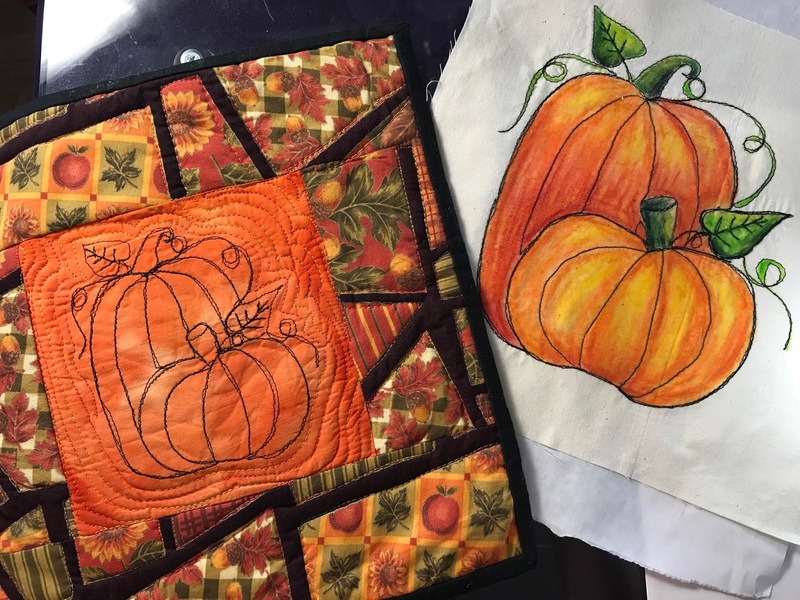 Press your thread sketched pumpkins. You are now read for the next part of the project. In September 2017, I did a Facebook Live presentation on how to use this pattern in the group. So if you want to see me demonstrate the process come on over and join us! May your bobbins be full!